This is a core, hands-on reference for surface and colloid scientists, physical chemists, chemical engineers, soft materials scientists, food chemists, controlled release scientists, and pharmaceutical scientists in drug delivery applications, as well as for graduate students in these disciplines. 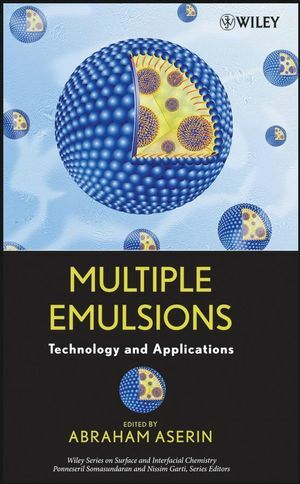 The editor and contributors hope this logical consolidation of current information will further the understanding of multiple emulsions and lead to new, practical applications. Abraham Aserin, PhD, is a researcher at the Casali Institute of Applied Chemistry at the Hebrew University of Jerusalem, Israel. His research is focused on many practical facets of surfactant chemistry, such as emulsions, microemulsions, lyotropic liquid crystals, dispersions, and improvement of drug bioavailability. Dr. Aserin received BSc and MSc degrees from the Hebrew University of Jerusalem, Israel, in 1978 and 1981, respectively. He earned his PhD in surfactant chemistry there in 1987 under the supervision of Professor Nissim Garti.